Two years ago, we published a blog post called “The Volkswagens of the glass tempering business” to address the same issues in the tempering line manufacturing business. If you haven’t had a chance, check out that article for a real-life example. That’s why I feel it is necessary to take this discussion into specifics. 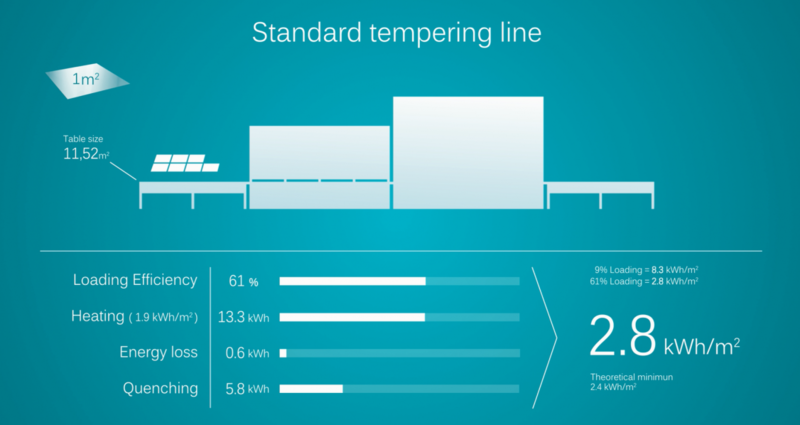 For a quick summary, check out our Glass tempering energy consumption animation. Glass tempering consists of two phases: heating and quenching. First, glass must be heated to a temperature well above the transition point of +567 °C but below the softening point of +710 °C. Usually, glass needs to be heated to a temperature of at least +630 °C to achieve a good tempering result. After heating, the glass must be cooled quickly and uniformly at a controlled rate well below the strain point of +510 °C. Only after this phase can the glass be cooled further to reach its handling temperature. If you are interested in reading more about the physics behind glass tempering, take a look through the Glass Tempering Handbook. It is important to understand the terms that are used when discussing energy consumption. These terms may vary a bit in different companies, so most importantly, always make sure the figures you get include everything from heating to cooling. This includes all metrics and variables in the heaters, convection as well as energy losses from the furnace and the blowers. Also make sure the numbers reflect real, continuous production. Below are the most common terms you will need to gain a better understanding of this topic. Connected power: The total power of all electrical components connected to the tempering line. Contrary to common belief, connected power is not directly linked to energy consumption. High connected power is needed so that the furnace can process large loads without loading delays. This means the furnace is able to recover quickly from the previous loads. Because glass always requires a certain amount of heat to reach its tempering temperature, energy consumption in glass heating will be exactly the same – regardless of connected power. In fact, high connected power might even save you some energy, since the waiting time for the furnace to recover between loads will be shorter. Energy consumption might vary between different furnaces, due to furnace insulation and convection technology. Heating power: The total power of the furnace, including the heater power and convection. Quenching power: The total power of the blowers used for quenching and cooling the glass. Energy loss: Waste energy from the furnace. Some heat always radiates through the furnace walls. However, with well-insulated modern furnaces, the amount of energy loss due to radiation is minimal compared to total energy consumption. Energy consumption in production: The amount of energy used in production, usually measured in kWh/m² . This metric consists of heating, quenching and energy loss from the furnace. Be cautious when evaluating the energy consumption figures you have been provided. Always compare the information you are given with the minimum figures you know you’ll need for your production. Always make sure that all components are taken into account. Remember the metric 0.475 kWh/m²*mm. It is the absolute minimum that is needed for heating the glass. For 10 mm glass, this would mean that a minimum 4.75 kWh/m² is required for heating alone. On top of that, you need to add quenching. So, when you see values that are lower than what is minimally required for heating, you know right away something is wrong. The case described in the article “Volkswagens of the glass tempering business” is a good example of the situation when the manufacturer claims that its equipment can run the whole tempering cycle with only 0.20 kWh/m²*mm. This is a radical example, but unfortunately, situations like this are not as uncommon as you may think. If a supplier is intentionally giving you false information to make its equipment look better, who knows what other data has been tweaked to get your business? At this point, it’s fair to ask why you should believe the figures above. In the next blog post, I will explain some theory behind the numbers, so you can understand the physics behind those numbers. I’ll also discuss heating and cooling in more detail. No disreputable supplier will ever be able to pull the wool over your eyes after that.